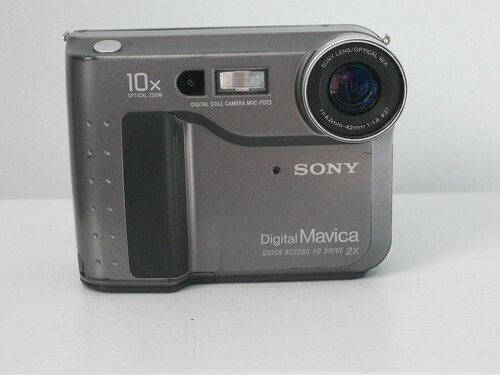 The MVC-FD73 was the basic model in the third-generation digital Mavica series from Sony, introduced in 1999 alongside the Mavica FD83 and FD88. As with earlier digital Mavica models, 3.5" standard floppy disks were used for storage, simplifying the transfer of images to a computer, helping make this a popular line of digital cameras in its era. 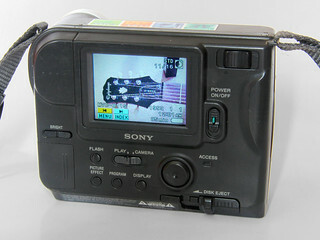 The sensor resolution of 640×480 pixels is modest (suitable mainly for web or email uses), but helpful in keeping file sizes small (at the highest quality settings, a 1.4 MB floppy can hold a maximum of 20 JPEGs). The specifications of the lens were more generous: the f/1.8–2.9 4.2–42 mm lens give a 35mm equivalent coverage of 40–400 mm. As with the original FD7, the FD73 offered four in-camera "picture effects," namely Sepia, B&W, color negative, and "solarize." This page was last edited on 1 December 2014, at 03:23.